(Colorado Springs, Colo.) – Curtis McDowald (Jamaica, N.Y.) won his first individual World Cup medal on Saturday with a bronze in Buenos Aires. McDowald, who placed eighth in his Senior World Championship debut last year, climbed to No. 7 in the FIE World Rankings after his medal win. The 23 year old went 4-1 on the day, overcoming a Senior World medalist and taking two clutch 15-14 victories. The first of those one-touch wins came in the table of 64 against 2017 Senior World Team member Cooper Schumacher (Forest Hills, N.Y.), 15-14. After controlling his table of 32 bout against Josef Mahringer (AUT), 15-7, McDowald faced Andrea Santarelli (ITA), who was coming off a silver medal from the Budapest Grand Prix earlier this month. McDowald took the bout, 15-14, advancing to his first quarter-final on the circuit this season. Fencing 2017 Senior World bronze medalist Richard Schmidt (GER), McDowald guaranteed a podium finish with a 15-9 victory. He lost in the semis to Gabriele Cimini (ITA), 15-6, but earned bronze for his first individual World Cup medal at the junior or senior level. With only the Division I National Championships remaining before the Senior World Championship Team is named next month, McDowald, Jake Hoyle (New York, N.Y.) and James Kaull (New York, N.Y.) have each locked their positions on the team due to results over the course of the season. It will be the second World Team for both McDowald and Hoyle while this marks Kaull’s first Senior World Team after representing Team USA at the 2011 Junior Worlds. Hoyle, who won bronze at the last two senior international events, earned a bye into the table of 64 as the No. 5 seed, but lost his opening bout to Hippolyte Bouillot (FRA). After a 5-1 finish in pools on Friday, Kaull defeated Christian Schack Linnemann (DEN), 15-14, in the preliminary table of 128, but lost to Sung Ho An (KOR), 15-10, to make the second day. In the race for the final position on the World Team, 2017 Senior World Team member Adam Rodney (New York, N.Y.) moved up to fourth with a top-64 result. Rodney went 2-4 in pools, but rebounded in the preliminary direct eliminaton tables, winning three straight to qualify for the 64, besting Lefan Yu (CHN), 15-8; MInseong Son (KOR), 15-13, and Luca Sponga (SUI), 15-12. In the 64, Rodney lost his bout to 2012 Olympic Champion Ruben Limardo Gascon (VEN), 15-7. 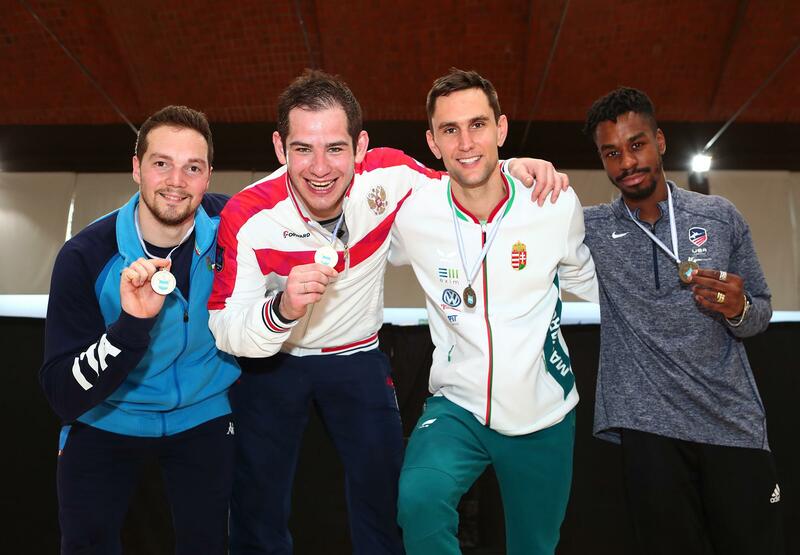 Rodney holds a lead of approximately 200 points over Alex Tsinis (Little Neck, N.Y.) in the USA Fencing National Team Point Standings and a lead of more than 675 points over Alen Hadzic (West Orange, N.J.) who moved up to sixth. Hadzic finished 5-1 in pools to advance directly to the 64, but lost to 2015 Doha Grand Prix Champion Vadim Anokhin (RUS), 12-11, on Saturday. A 2014 Junior and Cadet World medalist, Justin Yoo (La Verne, Calif.) earned his first top-64 result on the senior World Cup circuit. After a 4-2 finish in pools, Yoo defeated Jose Felix Dominguez (ARG), 15-12, and Riccardo Barionovi (ITA), 15-13, to qualify for the second day where he lost to Ronan Gustin (FRA), 15-10. In the team event on Sunday, McDowald, Hoyle, Rodney and Kaull placed seventh. Team USA opened the day with a 45-43 victory over Cuba. Although Team USA won the first three bouts, Cuba responded and took a one-point lead going into the eighth, 35-34. Nevertheless, McDowald and Hoyle each won his final bout to advance to the 16. Once gain winning the first three bouts, the United States jumped out a 15-10 lead over Ukraine, but the Ukrainians pulled within one after the fifth. Team USA won three of the final four rounds to secure the match, 45-40. In the quarter-finals, Team USA fenced Venezuela, who was coming off an upset over No. 2 Korea. Down six with four bouts remaining, Hoyle took the sixth, 6-4, and Rodney won the seventh, 8-5, to cut the lead to one. Venezuela built the lead back up to four going into the final bout and although Hoyle won the anchor bout against 2012 Olympic Champion Ruben Limardo Gascon, Venezuela held on for a 45-42 victory. In the 5th-8th place table, Team USA lost to Italy, 45-26 as Italy won seven of the nine bouts. With Kazakhstan withdrawing from the competition, Team USA automatically took seventh place.